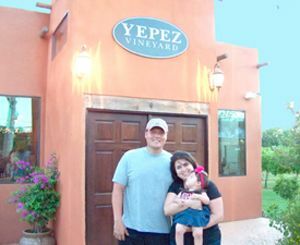 On a long, sparse stretch of highway FM2354 through Beach City, a pleasant surprise is in store for the public, when they discover Yepez Vineyard. On 20 acres of land, David Yepez and wife Lena have established not only Chambers Countys only vineyard, but also an entertainment venue that is truly a gem. Every summer evening in June, July and August, you can enjoy music from the Curry brothers, while you also try the varieties of wine that David and his family are producing from grapes grown on the property, and from other Texas grape growers. David started the first planting of grapes in 2005, a choice of Blanc de Bois and Black Spanish grapes. These are varieties that have shown to grow well in the coastal areas of Texas, he said. Blanc Du Bois is a yellow/gold grape that can be made into a charming Alsace style dry wine with a slight Muscat aroma. Black Spanish grapes are a traditional dark red grape, excellent for making Port wine. In addition to growing and making wine, and selling it at retail at their location in Beach City, they also offer the Vineyard as a location for special venues such as family and company picnics, private and public wine tastings, private and public winery events, live music, corporate meetings, engagement parties, weddings, anniversaries, birthdays, baby and wedding showers, and other special events. And if you want to participate in the wine making process, there will be a Grape Stomp Fest from 12-6 pm on Sunday, October 29th. (Weather permitting). Over the winter, from October to May, the Public Tasting Room is available on Fridays and Saturdays from 12 to 5, and on Sunday from 2 to 6. In the summer months, June to September, the hours are longer, Friday and Saturday 12 to 6. Also in the summer months of June, July and August, summer concerts on the patio are for public and family enjoyment. You are invited to bring a picnic and a lawn chair, and have a good time. David says that this year they are expanding into growing olives, and will be producing olive oil in the future as well. HIGHLANDS Jim Brazzil loved writing, newspapers, Highlands, and life. Brazzil passed away early Tuesday morning, leaving a legacy of friends, family, and community service that influenced many lives and careers. Brazzil is best known as the founder with his brother-in-law Alton Neatherlin, of the Highlands Star newspaper. Attracted to Highlands by the charm of the small town, the friendliness of the Rotary Club, and the need for a newspaper, starting in 1955, they served the community for 20 years, until Jim retired and Alton continued the paper which is today the Star-Courier under present owner Gilbert Hoffman. During his tenure, the Star won 35 awards of excellence from the Texas Press Association. 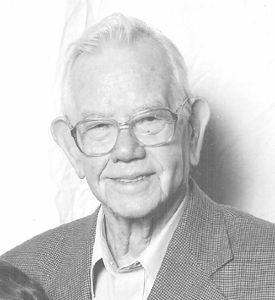 Brazzil wrote three books after his retirement, about his early life in Coryell County, and his years as a newspaperman. 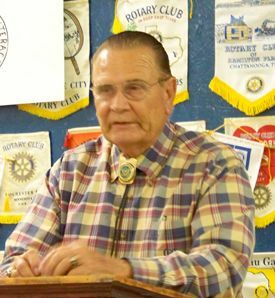 In 2007 he was honored by the community with the Terry Davis Award for Outstanding Community Service. Brazzil was known for his kindness and concern for others, and indeed even after many years he continued to express interest and praise on the present-day Star-Courier. A complete obituary for James Wilson Brazzil is on page 6 of this newspaper. CROSBY Once again the San Jacinto River has claimed a life, but this time it was a tiny child that wandered away from her family. According to authorities with the Sheriffs office, last Sunday evening, June 26, 22 month old Tiffany Cleto was playing on the sandy beach along the river near Magnolia Gardens Park. This is on the west bank of the river, upriver from Loves Marina where only a few weeks ago Harris County Sheriff Adrian Garcia warned the public of the dangers of the river, and cautioned them to use extraordinary care to save lives. According to HCSO spokesperson Christina Garza, unfortunately, little Tiffany wandered away from the eyes of her family. Although missing for only a short time, she went into the water, and was found underneath a dock by a searcher, who pulled her out but was unable to revive her. She was found about 6:30 p.m. and help was called to try to revive her. She was transported to East Houston Medical Center in Northshore, but was pronounced dead there. According to authorities, this is the eighth drowning in the Houston area this year, and the fourth in the San Jacinto River since last May. Victims have included swimmers and boaters, so caution is called for. HIGHLANDS Speaking at a recent Rotary luncheon, Harris County Pct. 3 Constable Ken Jones outlined the problems that his office has had with a reduced county budget, and what steps he has taken to preserve jobs and keep service standard close to normal. Jones said that the county cut all constable budgets, and his went from $12 million to about $10.5 million. He has had to reduce work hours and cut purchases of new equipment such as 11 patrol cars. However, he has not had to fire any employees in his department, unlike some other precincts who have lost as many as 100 deputies. Jones says that he has been able to maintain patrols and other services through the dedication and hard work of his staff. He now has 85 deputies at work. Citing recently developed crime stats (see box) Jones noted that the criminals know about reduced staffing. Since March, when staff hours were reduced, crime calls have increased up to 16 percent. But, says Jones what counts is how many crimes you solve, not how many calls you answer. Due to the success of its single stream curb-side recycling program, the City of Baytown, in partnership with Waste Management, has begun implementation of a six-month pilot program designed to provide residents with more capacity for recycling. As part of the pilot, three participating neighborhoods have or will soon receive a 96-gallon recycling cart. Collection days in the pilot area will remain the same; only the size of the container will change. The new, larger containers will allow participants to increase their recycling and decrease the amount of trash put out for collection. There is no additional cost to the resident. A wide variety of items can be recycled city-wide, including paper items, glass, tin or steal cans, aluminum cans, and plastic bottles or containers. Paper items that are collected include paper cardboard, dairy and juice containers, paperboard, magazines, newspapers and junk mail. Plastic items that should be recycled will be labeled with the recycling symbol and a number 1 -7. Items that should not be included in any of the recycling receptacles include food waste, films, plastic bags, plastic wrap, or foam cups and containers. Yard waste should also never be included in either the new recycling cart or the standard blue bin. To ensure collection, recycling should be placed at the curb by 7 a.m. on your recycling day. During the pilot program, recycling through out the City will continue as usual. For more information on recycling visit www.wm.com, or call the City of Baytowns Public Works Department at 281-420-5300. HIGHLANDS Only three weeks after Harris County Sheriff Adrian Garcia held a news conference on the shores of the San Jacinto River, warning of the dangers of drowning in these waters, and emphasizing boating safety and swimmers not overestimating their abilities to handle the currents and obstacles in the water, the river took another life. On Thursday, June 16 at about 10 a.m. two teenagers were swimming in waters near Banana Bend Beach on Sandy Lane. A 17 year old and a 13 year old were swimming, when they began to have trouble in the water. A 45 year old man entered the river to help them. He pulled the younger boy to safety, but had trouble with the currents and was unable to pull the 17 year old out, nor himself. Another man helped extricate them, and CPR was performed. Highlands EMS and Crosby EMS answered the emergency call, and then sent the 17 year old by LifeFlight to Hermann Memorial hospital, where he survived. However, the man who first entered the river was not revived, and he was transported by ambulance to a local hospital where he was pronounced dead. Highlands EMS reported that two other persons almost drowned the week before at the same location, and since May of this year there have been a total of 3 drowning deaths in the Banana Bend area. Harris County Sheriffs office said that on the river and Lake Houston, there have been a total of 7 drownings this year, involving swimmers and boaters. Highlands Fire Department has kept busy this week with other types of emergency calls also, they report. On Friday they answered a call on the I-10 bridge westbound, at about 11:30 a.m. when a woman drove an SUV into the back of a stopped trailer and pickup, killing the driver of the stopped vehicle. There were 4 other persons in the struck vehicle, but they were not hurt. HVFD has also been answering small brush fire calls, but to date no major wildfires have occured. HIGHLANDS The Rotary Club of Highlands has installed new officers and a new board, for the next year starting July 1 and ending June 30, 2012. The new president is Denise Smith, who it was announced at the dinner is now Chief Clerk in Judge Mike Parrotts office. The installation was held at the Baytown Boat Club on Clear Lake Road in Highlands. About 75 persons attended, including the families of many of the new board members and officers, the Interact Club officers from Chinquapin and Goose Creek Memorial High School, and special guests including Judge Don Coffey, Constable Ken Jones, and Judge Mike Parrott and their wives. Cooking was done by the Henderson Cooking Team and Charlie Ward, and music was provided by Bill Manahan. In her outgoing remarks as retiring president, Michelle Lomazoff spoke of the accomplishment of the club in the last year. She said that Rotary International has added another category or avenue of service for clubs to follow, which is New Generation. The Highlands club has sponsored two Interact (High School level) clubs, has served presents to perfect attendance students at Highlands Elementary, and donated bicycles and dictionaries to the schools. It has also provided $30,000 in scholarships this year, to 18 students from the area, and it has also sponsored a large group of Interact students to attend the national conference. In the coming year, Rotary will sponsor and support an interntional exchange student, a girl from Spain who will arrive in August. She will attend Goose Creek Memorial, and live with the Smith, Cotten, and Scott families for the year. Awards were given out by President Lomazoff for outstanding work during the year, and perfect attendance. The longest attendance award went to Weston Cotten for 25 years. The Rotarian of the Year, the most prestigious award the club has, was won this year by two persons, voted on by the membership. They were Betty Brewer and Michelle Lomazoff. Denise Smith welcomed the audience as she accepted the office of president, and spoke of her plans for her next year. She reviewed the results of the 2011 Chili Feast, which raised over $100,000 and netted the club $70,000 for projects and scholarships. She noted that this is quite an accomplishment for only 24 members. Denise plans to continue the scholarship program, and hopes to expand it with revenue from the Chili Feast. The club is very active this year and next with the local schools, and has applied for a $2500 Rotary grant for Partners In Education. She said her year would be more active with Interact, and the exchange student. She is working closely with the Rotary presidents of nearby clubs, to work on joint projects. She closed by admonishing the club members to invite a guest to ehlp a Rotary Project, and to Share your passion for Rotary with others, inviting them also to attend a luncheon. 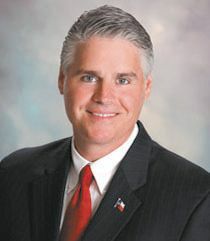 Austin, TXJune 16, 2011This week, State Representative Dan Huberty was named Rookie of the Year by Texas Monthly. The announcement was made along with the biennial list of 10 Best and 10 Worst Legislators by writer Paul Burka. After the initial announcement, Texas Monthly gave reasonsfor their selections. Hubertys title was included in the Special Awardssection. Burka had the following to say about the freshman member, If there were such elections, he would have won freshman class president by a land slide. The former president of the Humble ISD, Dan Huberty is self-assured,diligent, and willing and able to tackle tough issues. In a session fraughtwith partisanship, he made a point of working across the aisle, joining forces with Democrat René Oliveira to co-author a school exemption amendment to thedivisive sanctuary cities bill. 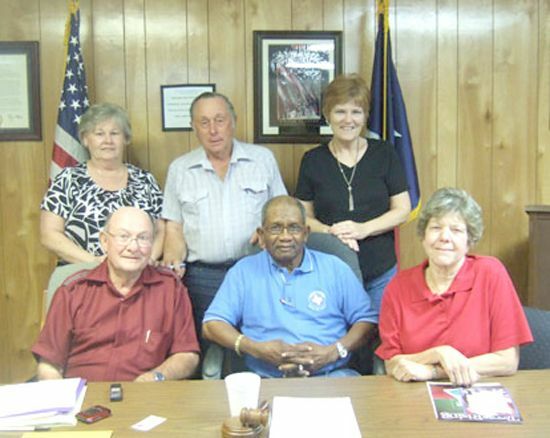 LIBERTY, TXOn Tueday, June 7, 2011 the Sheriffs Office received a call from a psychic alleging that approximately 30 bodies were dismembered at a property located in the intersecction of County Roads, between Hardin and Daisetta in Liberty, TX. Sheriffs Office along with Beamount FBI and DPS search the place. The Texas Rangers after going to the residence with a search warrant also help on searching the premises for any clue to solve the case. Officials said after doing a search inside and outside the residence nothing was found. The search included cadaver dog. The only thing authorities found was a bad smell from a rotting garbage. Law enforcement said the call may have been a hoax and prosecutors could pursue charges against the tipster, said McNair. MONT BELVIEU This community gained an extensive new facility for the health of its citizens, when the Chambers Health organization held its Grand Opening on Tuesday of the new clinic building on Eagle Drive. Present for the ceremony were officials from the Hospital District #1, and Chambers Community Health Centers, Inc. as well as the public and medical staff of the clinic. Also present were Chambers County, city and federal officials that helped bring the project to fruition. 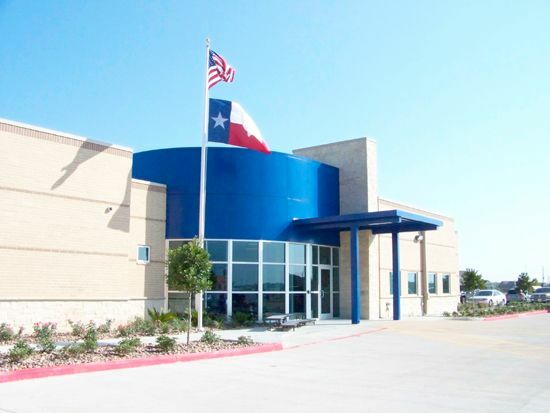 After recent hurricanes, federal officials including Senator John Cornyn helped secure the funding for the building, under the Social Services Block Grant program and a special program for areas impacted by devastation from past and future hurricanes. The building will serve as a shelter and a medical facility during severe weather conditions in the future. At the ribbon cutting ceremony, remarks were made by CEO Bob Pascasio, Public Hospital District Vice-chair Marian Whitley, Mont Belvieu mayor Nick Dixon, Community Health Center Chair Jack Waldrop, and Hospital Distric Chair Tommy Willcox. In addition, representing Senator Cornyn, Jay Guerrero read a letter wishing the endeavor success and support. The building is a FQHC, or Federally Qualified Health Center primary care provider, delivering a variety of services including family and industrial medicine programs and services. These include pediatric programs including immunizations, womens health care, geriatric services, adult medicine, employment and school physicals, occupational health services, minor surgical procedures such as laceration repairs, cyst and wart removals, etc., wellness programs and services, patient counseling and education, and inhouse routine lab services and diagnostic imaging, including x-rays, and CT scans. Tours of the building after the ribbon cutting revealed exam and treatment rooms, a nursing station, doctors offices (three full-time on staff at this time), labs, radiology including a CT scanner with digital files, business offices and break rooms, surgery and recovery rooms, and even a play room for children. The building layout suggested that expansion would be possible at a future time, also. The public is encouraged to come to see the new facility, and make use of the modern health care services available. Staff speaks Spanish as well as English, and can be reached at 281-576-0670 for an appointment.